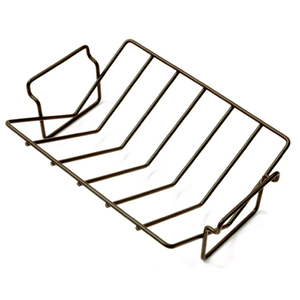 This sturdy nonstick roasting rack is ideal for turkeys, chicken or roasts. By raising the meat, you allow consistent hot air flow around the rack for even cooking. Measures, 13" x 10"/33cm x 25.5cm Coated with a silicone nonstick finish. Large side handles for easy lifting. Nonstick makes it easy to clean. Hand washing recommended.